Tanya Huff’s “Confederation” series has a fabulous heroine, Torin Kerr. As the series begins, in Valor’s Choice, Kerr is a Staff Sergeant in some futuristic Marine Corps. In this opening yarn, Huff demonstrates good character development, better world building, and a wonderful flair for dialogue. While I really like other heroines of military sci-fi yarns such as David Weber’s Honor Harrington and Elizabeth Moon’s Esmay Suiza, those characters are officers. Huff’s non-com is gritty and more realistic than either of those officer-characters. 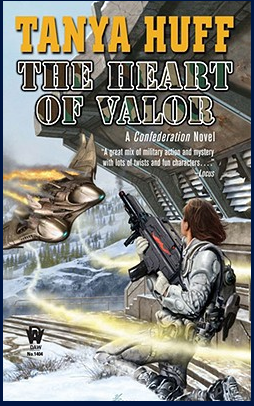 Recently, I purchased The Heart of Valor, the third installment in the series. Kerr has been promoted to Gunnery Sergeant after her exploits in books one and two of the series. Her new found fame is unwelcome, so she jumps at the chance to accompany a platoon and some observers to Crucible, a frozen planet where recruits complete their training. Kerr is there mostly to watch, but once the training platoon arrives on Crucible, there is a series of unfortunate events. A longtime drill sergeant becomes ill, the training drones are out to kill rather than test the recruits, and something odd is happening with the the single officer in their midst. Of course, Kerr works overtime to save her comrades, by using all of the knowledge she has accumulated in her career. While not boring, this third installment seems rather predictable, until Kerr figures out why things have come unglued, and the plot becomes much more interesting. Unfortunately, that happens about two thirds of the way through the book. The suspense ramps up along with the action, and a three star book becomes a five star read. I enjoyed The Heart of Valor, but I can’t say it lives up to the first two novels. Readers who like feisty heroines, humor, and lots of action should enjoy it, and the series continues with two more installments. I’m reading the next one now. 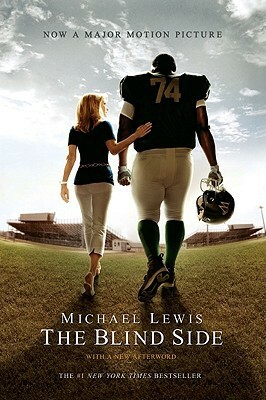 Last Christmas, the movie version of The Blind Side opened in theatres. Although I seldom watch television, hubby and I were in Charleston for our anniversary (what a great place for a romantic trip!) and he had turned on the telly one evening while we were getting ready for dinner. A reviewer proclaimed that Sandra Bullock should get an Oscar for her role in this movie, and the movie poster shot zoomed to the screen. At the time, we were more interested in she-crab soup and touring the battery, but after Bullock won an Academy Award and the DVD became available on Netflix, we watched the film. Great movie, but I wanted to know what they left out. As anyone who both reads books and views movies knows, rarely is a movie made without leaving plenty of material on the page. Just as the news is less satisfying on television than in a newspaper, a movie, while entertaining, is less satisfying than a book. Quite simply, pages contain more information, and anyone who is even moderately literate can read faster than a film can unfold. So, I picked up a second edition of the paperback, the movie tie-in version with an afterward which contains some interesting observations by the author about reactions to the first edition. Michael Lewis’ book, The Blind Side, has a subtitle, Evolution of a Game. And the book contains much more information about football than the film does. The book opens with a gripping account of Laurence Taylor’s tackle of Joe Theisman, the one that ended the quarterback’s career. As the pages turn, The Blind Side alternates between discussions of the business of football, significant players and coaches, and the story of Michael Oher. Fans of football might be inclined to skim the passages which inspired the movie script, but fans of the film might skim the intricate treatment of the evolution of football. Actually, I liked both parts, although they don’t always blend together easily. Indeed, the Oher story is not told in a precisely linear fashion, and the football treatise has sections devoted to players, to coaches, and to others who have shaped the game. Lewis does a remarkable job of explaining how the game of football moved from a running game to a passing game, and it is fascinating. Of course, some readers will take far more from this book than others will. Even the title has multiple interpretations. Literally, it refers to the left side of the offensive line, because a right-handed quarterback turns his back to it as he scans the field. But, the phrase is also a tribute to the Tuohy family’s attitude toward Michael, and toward the friends and family members who could not understand why a rich, white, politically conservative family would bring a homeless black boy into their lives and ultimately, into their home. Of course, the film begins and ends with football, but it is primarily the story of how Michael Oher came to live with Sean, Leah Ann, Collins, and SJ Tuohy, and his voyage to becoming a left tackle at Ole Miss, and later, a highly paid NFL player. After I finished the book, I looked for videos of the real people who inspired both the book and the film, and YouTube has plenty of material. Interested readers will find interviews with Michael and the Tuohy family. My favorite one is with Mike Huckabee, and he calls The Blind Side a wonderful story for the holidays. And it is. Christmas stories fall into categories— religious, sloppily sentimental, and fairy tales. The Blind Side isn’t any of those, but it is quite appropriate for the season of giving. Both the film and the book are worthy, because the film is emotionally satisfying, but the book satisfies on several levels.